The Royal Wulff is a classic dry fly. 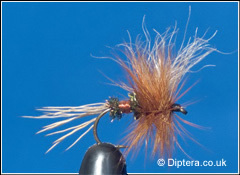 It floats very well in fast running water and is one of the most popular dry flies used today. The Royal Wulff has a white calf tail wing which doubles up as a good sight indicator.